Our specially designed truck (which is a powerful vacuum cleaner), will come to your home; our expert technician will attach a giant 10-inch hose to your furnace, turn on the power and draw all the dirt from your air-duct system with a “15,000 cubic foot of air per minute” force. While the entire duct system is under suction, all caked residue inside the ducts will be loosened with a patented steel “snake ball” which travels through the ducts by air pressure. As well, the Vacu-Man technician cleans every register outlet and return with a 200 PSI compressed air hose to ensure a final thorough job. Our expert technician removes the blower fan from your furnace and connects the vacuum suction hose securely from our unique duct cleaning truck, from the most convenient place in your home, to your furnace. The 10-inch vacuum hose, is applied to the fan compartment of the furnace, that draws 15,000 cubic feet of air per minute through your entire duct system. Every air register and return has built on residue loosened by a trained Vacu-Man worker and is then air blown clean with a 200 PSI compressed air hose by our licensed duct cleaning technician. 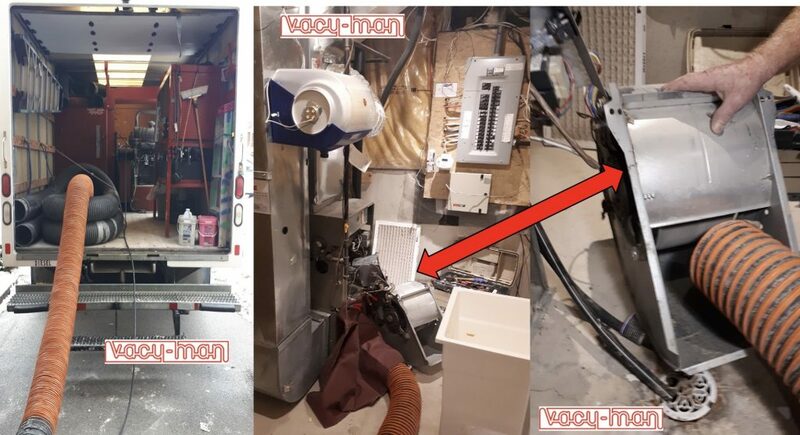 Drilling a hole, Vacu-Man will use our patent snake to blow all the dust, dirt and debris out to our vacuum located where the blower fan is located. Clean ducts are all that is left! While the ducts are under vacuum suction, we drill one inch holes into the main duct work. Our Vacu-Man “snake ball” is bounced through the holes in the duct work and through every duct channel loosening all caked dirt and dust within it. Once the ducts are cleaned, Vacu-Man will plug all holes and ensure that the furnace is cleaned along with the ac coils. The Air Conditioning (AC) coil is thoroughly cleaned, as well as the furnace fan, which is then carefully placed back into its compartment. The duct work holes are filled with air-tight plastic plugs. The entire operation is approximately two hours. Once your air-duct systems are clean, you will notice an incredible difference in efficiency as well as less particles throughout the air of your home. Clean ducts and powerful vacuum truck with over 40 years of business cleaning furnace and ducts.